The weakness of the U.S. dollar versus the euro doesnt mean Europe has to be so expensive--at least to those who take a cruise paid for in greenbacks. Smart Europe visitors who choose a cruise with Windstar Cruises aboard the lines 308-guest luxury motor sailing yacht, Wind Surf, can enjoy one- to two-week cruises with ports ranging from Lisbon to Barcelona, Marseille, Rome, Malta, Venice, and more (including the Greek Isles). In addition, Windstars 148-passenger Wind Star and Wind Spirit both sail throughout the Western Mediterranean and Greek Isles on widely varied seven-day itineraries. The sailing season generally runs from April to November. Windstars European sailing itineraries combine smaller, unique ports of call with long-time favorites like Venice and Rome. Guests may find themselves exploring Spanish Morocco in Ceuta, Spain; sipping cappuccino in Sorrento; testing Lady Luck in Monte Carlo; or shopping for hand-painted porcelain in Portugal. A rich mix of shore excursions (payable in U.S. dollars) adds to the allure. Generally speaking, cruises can be combined to create longer voyages, with no repeating ports of call--and might even be joined to a pre- or post-European season transatlantic voyage on any of the ships for the ultimate sailing adventure. Passengers combining cruises receive an additional savings off the second cruise. 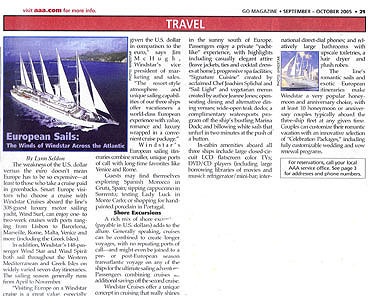 Windstar Cruises offers a unique concept in cruising that really shines in the sunny south of Europe. Passengers enjoy a private yacht-like experience, with highlights including: casually elegant attire (leave jackets, ties, and cocktail dresses at home); progressive spa facilities; Signature Cuisine created by acclaimed chef Joachim Splichal and Sail Light and vegetarian menus created by author Jeanne Jones; open-seating dining and alternative dining venues; wide-open teak decks; a complimentary watersports program off the ships bustling Marina Dock; and billowing white sails that unfurl in two minutes at the push of a button. In-cabin amenities aboard all three ships include: large closed-circuit LCD flatscreen color TVs; DVD/CD players (including large borrowing libraries of movies and music); refrigerator/mini-bar; international direct-dial phones; and relatively large bathrooms with upscale toiletries, a hair dryer, and plush robes. The lines romantic sails and exotic European itineraries combine to make Windstar a very popular honeymoon and anniversary choice, with at least ten honeymoon or anniversary couples typically aboard the three-ship fleet at any given time. Couples can also customize their romantic vacation with an innovative selection of Celebration Packages, including fully-customizable wedding and vow renewal programs. For more information, call your local AAA office, visit www.windstarcruises.com, or call (800) 258-7245. XXCORRECT FORMAT: For reservations, call your local AAA service office. See page 3 for addresses and phone numbers.